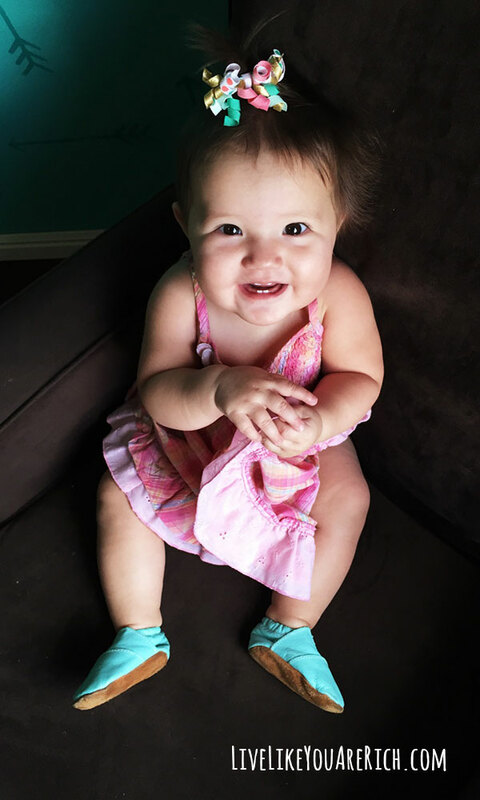 My daughter Aurora is nicknamed Bubblegum (just for now, because she is so squishy and bubbly). She is so happy, sweet, kind, and a total momma’s girl. She loves her older brother and playing with his toys. 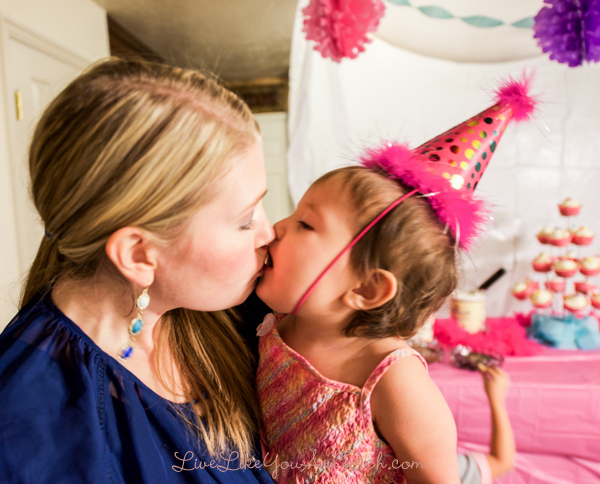 She just turned one and I wanted to share her birthday party here on my blog. 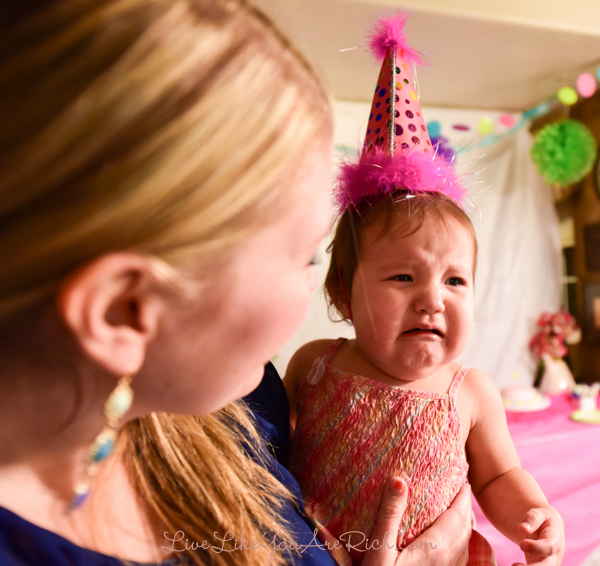 We held her party in the evening, and as a result, we didn’t have a lot of natural light. 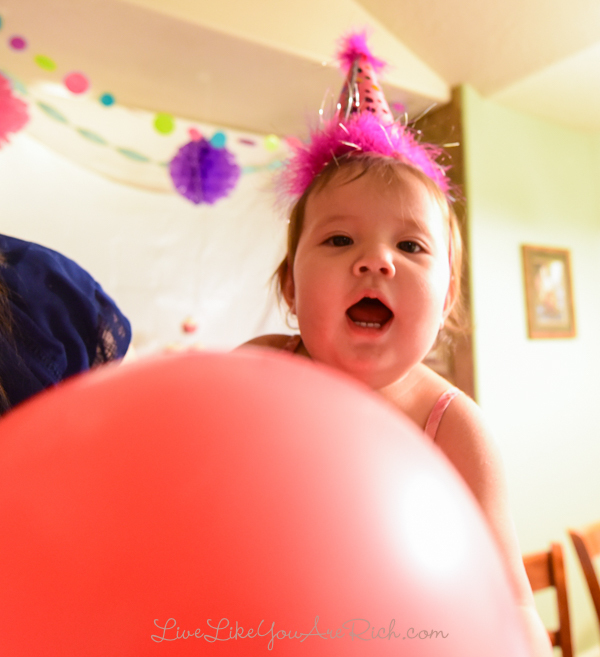 So the party photographs may not be the most beautiful, but my daughter, our family, and friends fully enjoyed themselves. To make the party more affordable and easy, we chose to have a dessert bar. We served cupcakes, ice cream, candy, and cake. 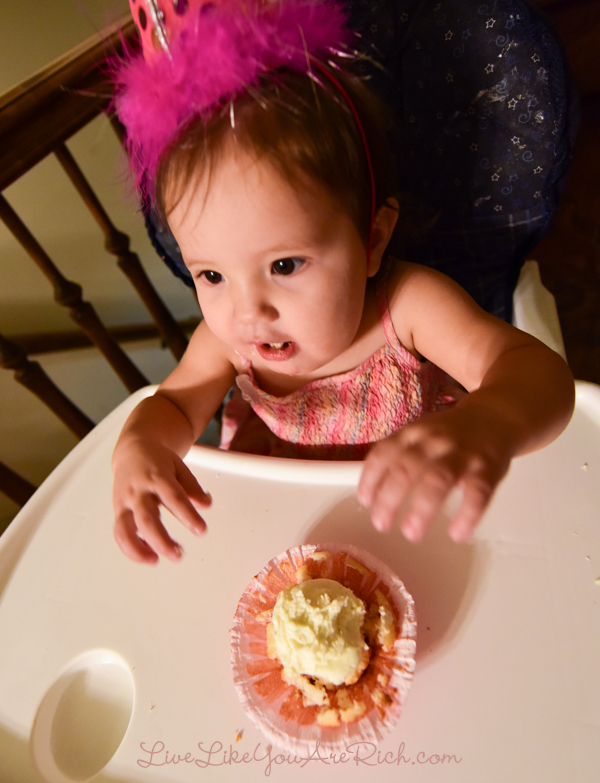 Truly the cupcakes were the hit of the party. 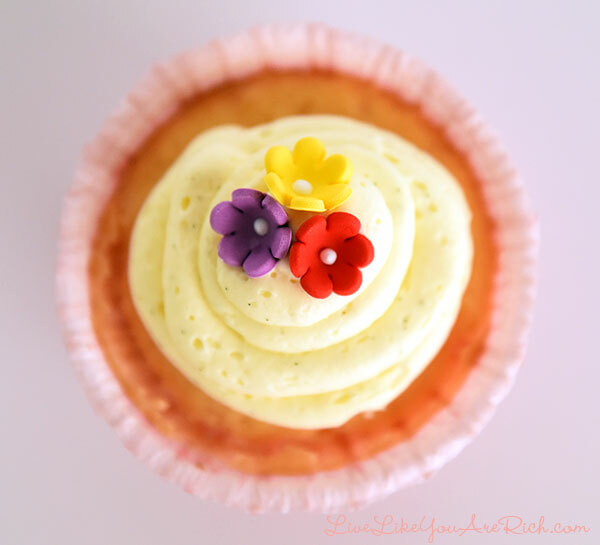 I bought pre-made fondant flowers to top them with. 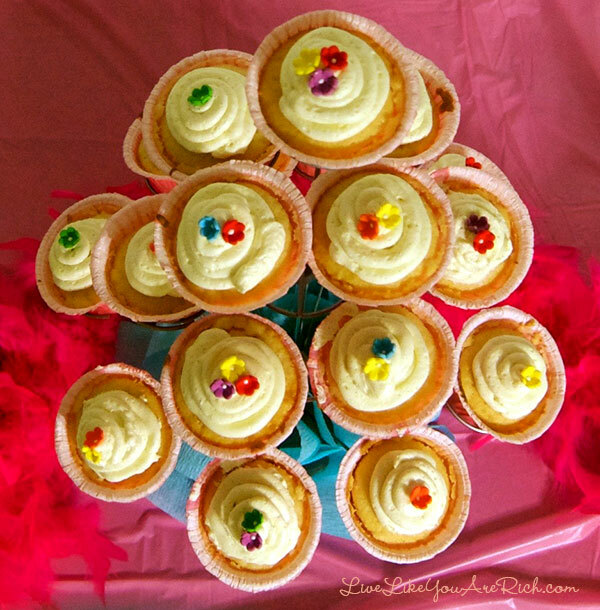 The cupcakes were made using a white cake mix (fancy I know). 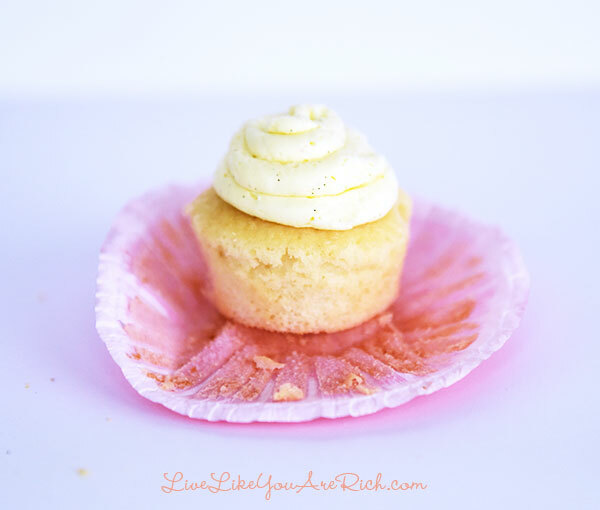 I frosted them with this amazing vanilla bean frosting (click link or the photo below). 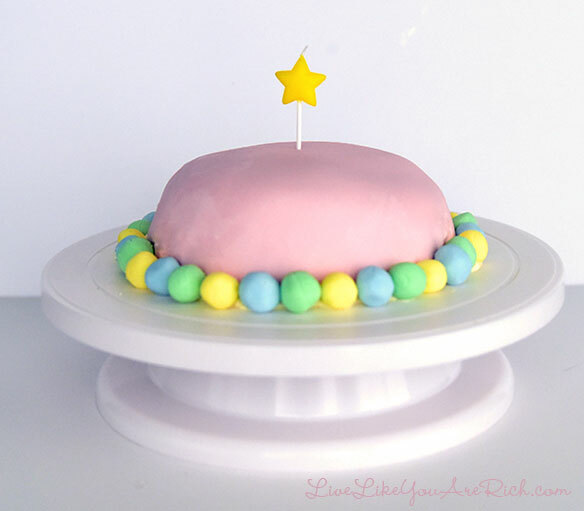 I stretched myself and made a fondant cake for the first time ever! 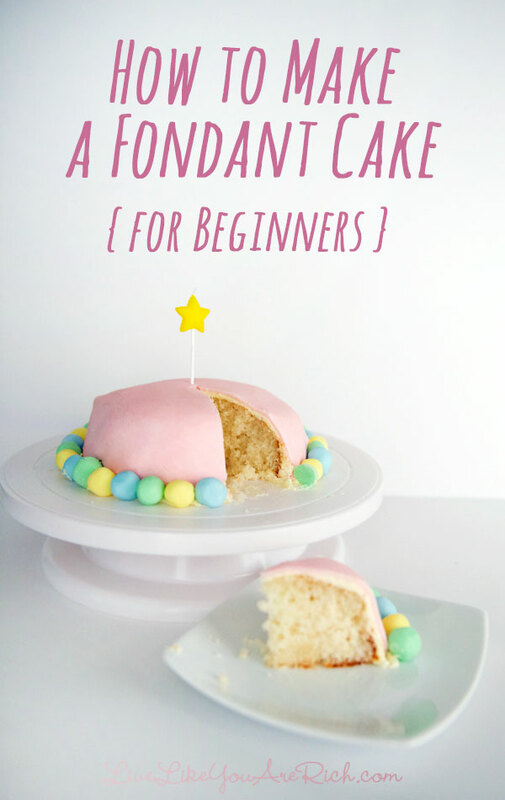 I posted a tutorial on how to make a fondant cake for beginners (click link or the photo below). It took her a while to recover from the shock of her balloon disappearing. But kisses from mommy made it all better. Besides this photo being one of my favorite because of our kiss…I also find it quite funny that my son took the opportunity of us being distracted to steal sweets from the dessert bar. 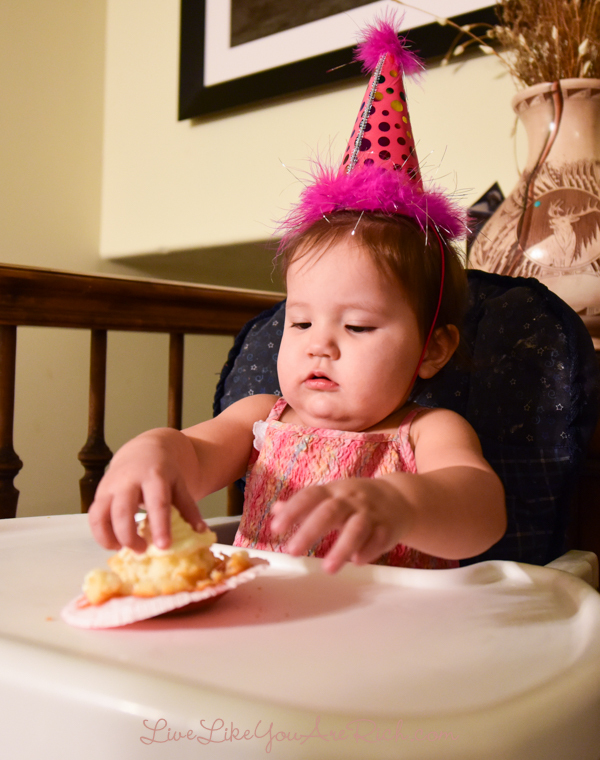 Bubblegum tasted cake and frosting for the very first time in her life. The ice cream and candy were a hit with not only my son but the other kids as well. After eating, the kids had a ton of fun playing and burning off their sugar rush for the next two hours while we adults sat and chatted. 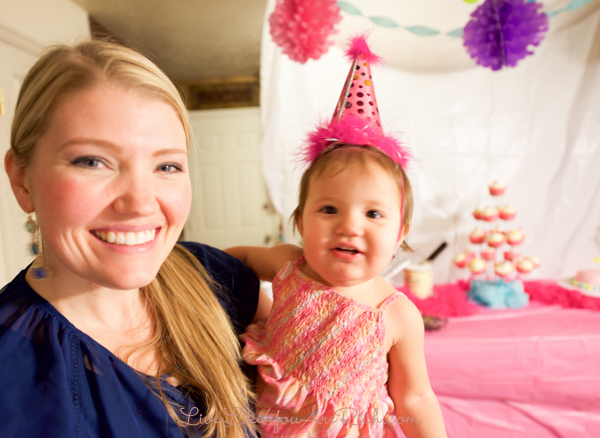 So while the party may not be entirely ‘Pinterest worthy,’ it was affordable, cute, and we all really enjoyed ourselves. Which is what a party is all about right? I’d say so. 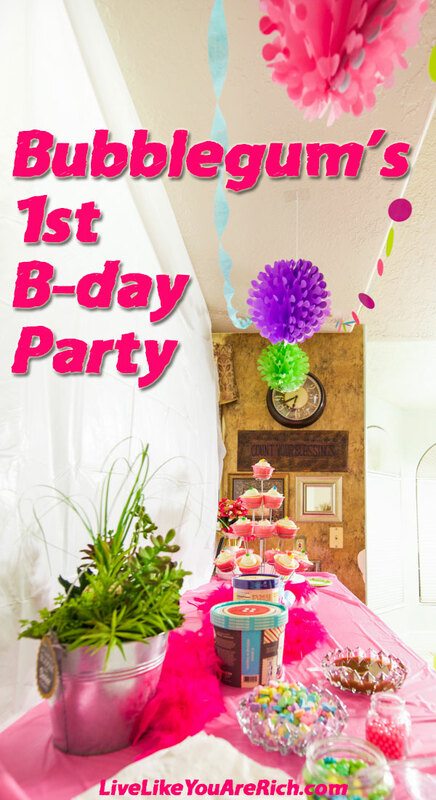 I spent under $100 on this, and many of the decorations are reusable to help offset costs on future parties as well. The cupcakes are on this stand. Wilton Ruffle Baking Cups, Standard, 24-Count, Pink found here. Wilton 710-2215 Icing Decoration, Royal Flower Rainbow, Mini which can be found here. Cake- I used this cake mix. sugar pearls found here -I had multiple different colors and shapes. Tissue Balls (Green, Pink, and Purple). Plastic table cloths (white and pink). Plus, I used a few things I had around the house. 6″ round pan from Wilton. non stick silicone mats and/or cornstarch to prevent sticking. multi pack of colors fondant. a candle or other decorations. I hope this has helped a little if you plan a future party. For other ‘living rich’ tips & recipes, please like me on Facebook and follow me on Pinterest and Instagram. You clearly have a future as a party planner! What great ideas! Awe you are really sweet. Thank you for stopping by. This was a sweet post! 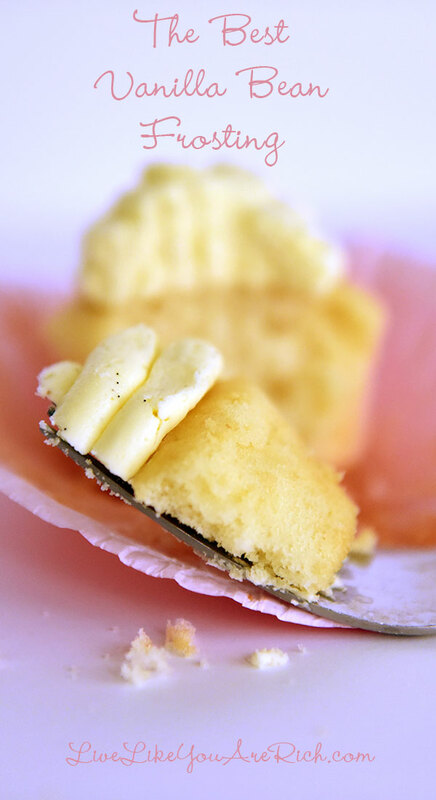 I love the close up photos of the cupcakes! I think you did a beautiful job on a budget. I’ll share with you one of styling tricks that I use for events- when in need of a backdrop, hang a pretty bed sheet or even blanket that will fit within the color scheme. Sometimes the texture of throws or the patterns on blankets add just the right amount of texture and in some cases, even a bit of luxury to a casual event. You did a wonderful job on that fondant cake too! That stuff can be tricky to work with. Two thumbs up, Anita. I’m going to share this post with my friend who just had her first child one week ago today. I think she will love it. She does lawyering, but enjoys reading blogs. I’m saving up ideas for her new little baby girl. Thank you! What a fantastic idea to use a sheet!! I’ll try that for the next party. I was sad that I accidentally bought the wrong size/shape table cloths but I still don’t love the plasticky look. So I’ll try a table cloth for sure. Thanks!! This is so cute! Happy birthday, baby girl! !